As I was seeking the Lord on what He wanted me to share, I was reminded about the fact that all change, all spiritual growth, all of our strides to be emotionally healthy are, in fact, a lifelong journey. It is definitely not a vacation because work is involved, as well as the fact that vacations typically have a beginning and an end. Because of God’s wonderful grace, He only shows us what we need to see. We may not see the end of the path but we trust that He leads us. He is trustworthy. Relax and make a decision right now that you will purpose to find some joy in your journey every day. Ask the Lord to help you and He will. One of the challenges that I’ve faced is the realization that I will always be repenting, growing, and being changed. Even when I think that I’ve experienced a great deal of growth in a certain area, the Holy Spirit lovingly enlightens me and shows me that there is a fuller, deeper revelation and furthermore puts a desire in me that compels me to seek for more. It is not like a task that has a clearly defined beginning and end that I can say is finally finished. The work of the Holy Spirit is an ongoing life-long process. As we are determined to go after the roots of destruction that were planted in our soul through sexual abuse we need to be cognizant of the fact that as we excavate and pull weeds out of the soil, there are sometimes other things that are unearthed and pulled to the surface as a result of our digging. Some of those things may be depression, anxiety, fear and anger. You may stir up feelings of rejection at work, church, home, in friendships. Insecurities may rear their ugly head. Just remind yourself that these are the things that will be directly affected as we take hold of our healing. Those roots will be plucked up. We are pressing toward the ultimate goal of being spirit led and not emotionally driven. Don’t get discouraged in the process. Stay the course. The outcome of walking as a secure, confident, stable, whole child of God is His plan for you so that you can do the things He’s called you to do. What are some of the things we can do for ourselves to aid us in the journey? Have a trusted friend’s number ready and let them know you may call for support if you hit a rough spot emotionally. Give yourself a break from journaling, grieving, or any other thoughts that may be causing you to feel anxious or overwhelmed. Use positive experiences to refocus your emotions. A Positive Movie or TV show (no violence or stressful situations, etc.). Go fellowship with a friend over coffee. Fun exercise – go for a walk, run, tennis, workout, etc. Take a nap and recharge. Feed yourself healthy meals/snacks. Junk food and emotionally driven eating tends to have the opposite effect than we want – which is comfort. Go to sleep at the same time each night to promote healthy sleep habits. Avoid Sugar or Caffeine in late afternoon/evening. Avoid stressful things toward evening. Have a bedtime routine – Ex. read, drink chamomile tea, brush teeth, pray, sleep. Remember HALT – The devil uses these things to trip us up. Have a plan in place to address each area. Don’t skip meals. If in between meals then snack on a healthy piece of fruit or cheese stick. If I’m really hungry, my “go to” is a protein bar. 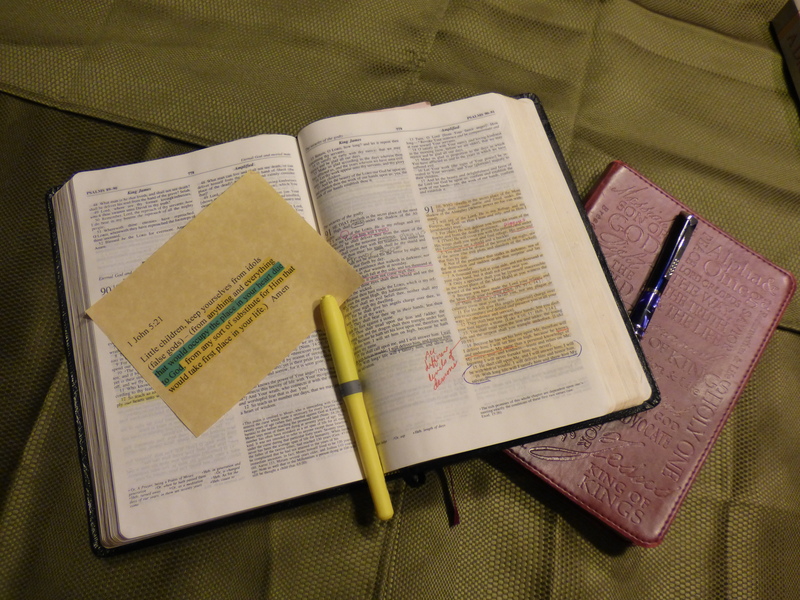 Read James 1:19-20 – write it out on an index card. Write down in your journal what, at this exact moment, you feel angry about. Tell yourself the truth about that situation. Examine your self-talk and redirect your thoughts and words to God’s truth. While going through this process, if you’re married make sure you are spending quality time with your husband. If you’re single then be sure to have time with family or friends that are supporting you in this recovery. Go be with people that are uplifting. Don’t be around people that are negative during this time. Retreat – Sometimes when I’m tired it is a reflection of doing too much, being around people too much, giving out too much. At that point it’s time for me to spend some additional time in God’s Word or praying. This refuels me. Begin to praise the Lord. Praise stills the enemy and stops the attacks against your mind, will and emotions. Psalm 8:2 – Out of the mouth of babes and nursing infants, You have ordained strength, because of Your enemies, that You may silence the enemy and the avenger. Recovery from the effects of sexual abuse is a process. It is an emotional journey that can be exhausting at times. You may ask yourself why am I going through this and will it make a difference. I believe that if you are committed to the program and let the Holy Spirit do His work in you while in your quiet times, then you will progress.